My Vegan Caramel Nutella Pancakes make an amazing and absolutely plant based, gluten free breakfast or dessert. 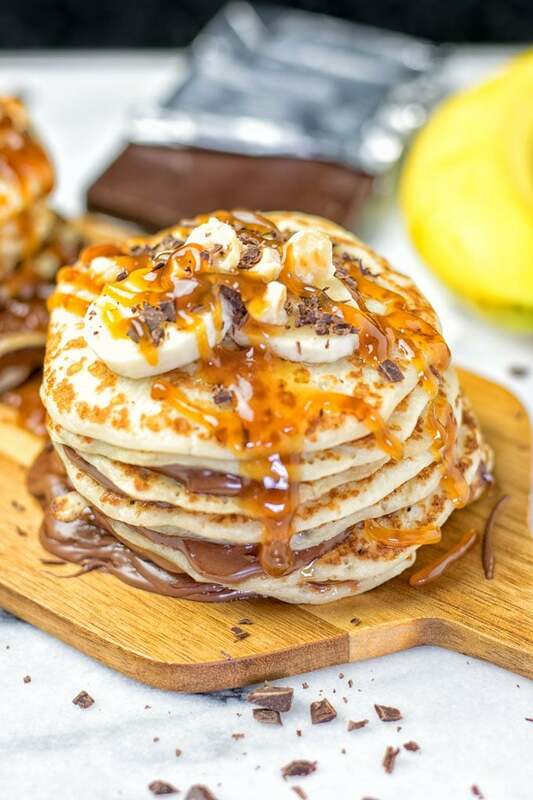 These most delicious pancakes are layered with a hazelnut chocolate spread and topped with homemade caramel. Could it be any better? No, because this is simply the best combo. 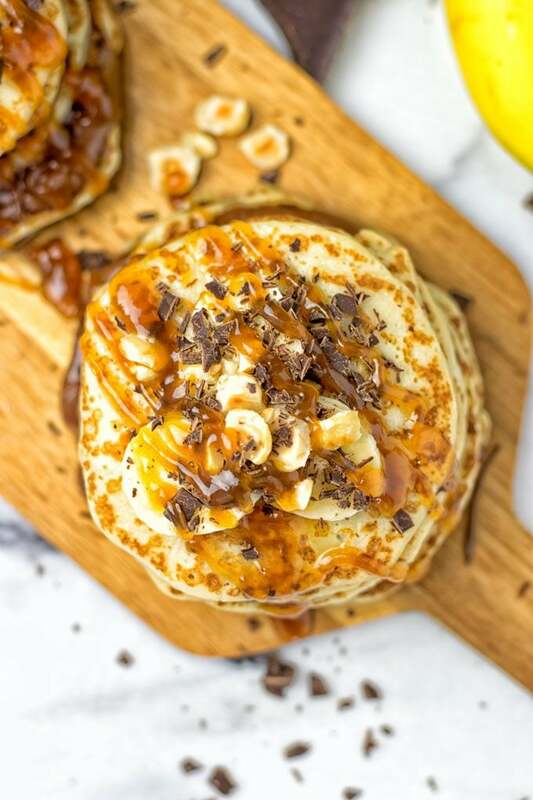 The pancakes are incredible delicious, I could eat them almost every day for breakfast, dessert, or both. And you will too. It’s just the timeless combination of the most amazing dairy free pancakes that you will ever make. I got rave reviews for my Vegan Pancakes recipe on Pinterest and Instagram. No wonder. It’s so damn easy, anyone can make them, there is no magic or trick. 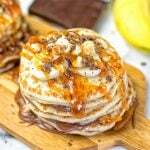 For these Vegan Caramel Nutella Pancakes, I use the same basic recipe for the batter. Although this time, I used cookie cutters (but you don’t need to) and made them thinner than usual. In my childhood and even later until I became vegan, I really enjoyed Nutella. This chocolate hazelnut spread was my big addiction, my big fondness. There was no need for bread or anything like that. Just need a spoon and I just ate it straight away. Do you know this feeling when you just need a spoon and nothing more for something like this? Of course, it’s not vegan or dairy free. That is no big secret. Also it’s safe to say that the spread is not really healthy. Because it contains a big amount of refined sugar and fat. So it was high time to bring my favorite back in a plant based and gluten free way. Which is obviously so much better combined with pancakes, hah. I still wouldn’t claim these pancakes are healthy, or life changing. But these are really addictive, delicious, and a must make. Life is too short for bad food. It always has to be good and delicious. So bring it on, friends. 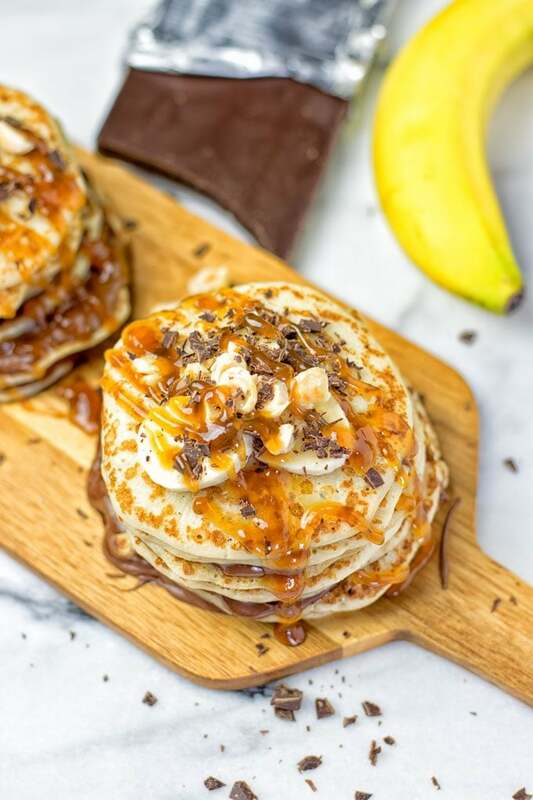 Get excited for these Vegan Caramel Nutella Pancakes. 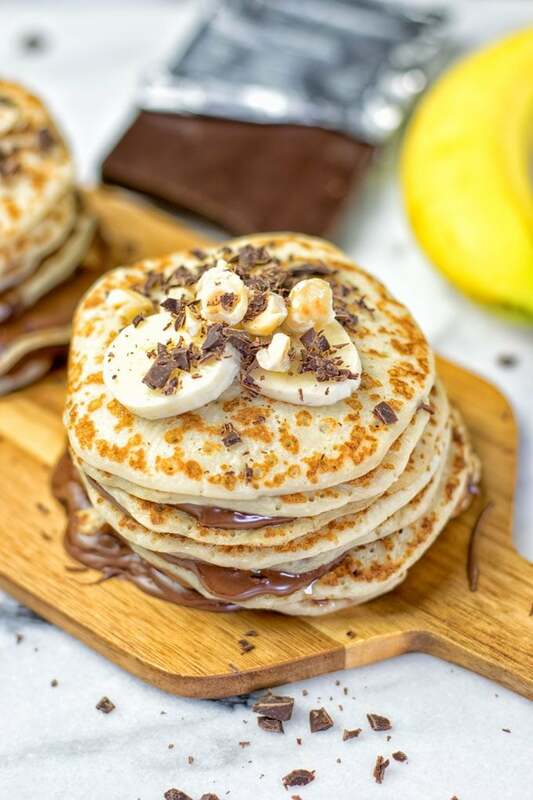 They will definitely brighten up every morning, are super satisfying, drool worthy, addictive, made for brunches, sweet cravings, timeless, chocolaty, mouthwatering, cozy and so comforting. First, prepare the vegan caramel and the pancake batter according to the directions. I suggest you bake thin, almost crepes-like, pancakes but I leave it up to you. Flip them once and set aside. Now you can choose how to serve them: Either take a single pancake, smear 1-2 Tbs of the hazelnut spread on top, or build a big tower. In any case, top with caramel, hazelnuts, banana slices, and chocolate shavings. Note: If the hazelnut spread is a bit too hard, warm it carefully in the microwave for around 20 seconds. It’s more liquid and easier to spread on the pancakes. Of course you can also do that on the stove in a double boiler. This makes a dazzling breakfast, dessert, or quick snack. Some notes about the vegan Nutella: I was lucky enough to find it at my local organic store here in the Netherlands, but I know it can be a bit tough to find elsewhere. Otherwise you can try it online, or you can do it easily homemade in 2 easy versions. Let me tell you how they work. First version: just buy hazelnut butter and make sure it’s made from 100 % nuts. No oil or sweeteners added. Then you just add 2 Tbs Cacao powder. Add 1/4 cup maple syrup to the mixture, mix well with a spatula. Or simply use your food processor and mix well and pulse sometimes. Second version: Roast 1 cup of peeled hazelnuts (without any skin) for around 10 minutes at 390°F. Transfer to a food processor, blend for around 10 minutes. It will take a bit of time until the oils are separated and the nuts are blended into a smooth paste. When you have that smooth paste, add cacao powder and sweeter to the machine and blend again until it’s really smooth and spreadable. You can can optionally add 1 tsp vanilla. Please don’t buy just a vegan chocolate spread which is made from cacao powder without any hazelnuts. Even though it will work for sure, the taste will be different. So I can’t vouch for accurate and precise results. I made these recently for a brunch with friends and everyone love these. Even all meat eaters can’t see any difference in texture and flavor. So these will be a big hit, any time. Also these are totally legit for your sweet tooth. A timeless dessert that will impress everyone. Planning a date night? First or permanent date, make these for your sweet heart and own all the compliments. 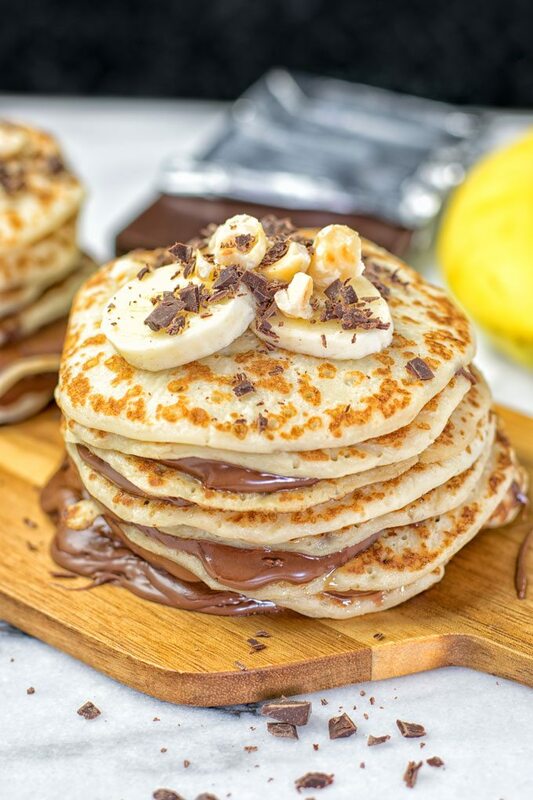 We add banana slices as a topping to the pancakes. These show stars are really a positive and amazing mood changer. I know from time to time we all have a bad day. When we are not feeling full of energy, these will do the trick. Thanks to the high level of tryptophan which puts all the negative thoughts away and changes them into a happy mood. It’s also a great food to eat before a workout. Your body will get a lot of energy, which is so good during a hard workout. Also your muscles will be protected against cramps and soreness. I could tell you some more benefits, but there is no need to. These are fully packed with amazing benefits. Plus most importantly, they are delicious. There is something special and something magic in the air when it comes to fall. Could you already imagine the crispy leaves which are so typical for this time? You know it when you realize that color turns from green into the vibrant colors of fall. That beautiful autumn glow which you see and excites you. Plus it’s time to use some candles for an amazing cozy atmosphere. Time for hot apple ciders, pumpkin spice lattes, hot chocolate. Never forget it’s so much fun these times and I can happily confirm it goes so well with these Vegan Caramel Nutella Pancakes. If you give this a try tag me on Instagram and Facebook, snap a picture. First, prepare the vegan caramel according and the pancake batter according to the directions. I suggest you bake thin, almost crepes-like, pancakes but I leave it up to you. Flip them once and set aside. If you make thin pancakes, one serving is 3 pancakes. Otherwise, 1 pancake per serving.